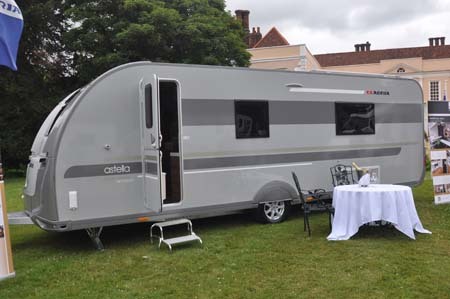 2014 Adria Astella Amazon Glam Caravan review: Phew, what a scorcher! Take a deep breath traditionalists. And maybe just look away. Then again… perhaps you should consider this essential reading. Whatever, here’s just another example that caravans can be more than just white boxes. Sure, it might have two (alloy, of course) wheels and a tow hitch, but it looks like no other caravan, with its swept-back silver and grey exterior and UK maximum 2.45m width. But, there’s more wow when you step inside. Even the interior layout should make you look, and think, again. From front to back, it goes kitchen, lounge, bedroom, washroom. Yes, the kitchen rally does occupy the whole of the front end. The kitchen actually extends around the offside. There’s a 104-litre fridge, over which sits an oven and grill.It features an extensive amount of spotless white worktop with an inset three gas burner hob (all different sizes) and a separate deep rectangular sink adjacent, served by a swan-neck mixer tap and complete with a clever drainer to add on. It all gives not just loads of workspace, there’s also virtually unbounded storage that’s especially easy to access thanks to super-size drawers, while the sunroof overhead will help keep the chef from feeling anything but cramped. Dark wood and brown leather dominate the rest of the interior interior. Taking its cues from yachts, hotels, upmarket apartments… you get the picture. Features like the swing-out lamp for the lounge help keep up the futuristic appeal. The example on review here includes the Astella pack, because it’s hard to see anyone ordering their Adria Glam without. It gives you Al-Ko’s ATC handling system, roof rails, wheel inserts and those alloy wheels (plus spare) outside, whilst indoors there are carpets, that drainer and sink cover, ambient lighting and Horrex blinds, and a flyscreen for the main door. The leather upholstery featuring here is another “must-have” option, surely. 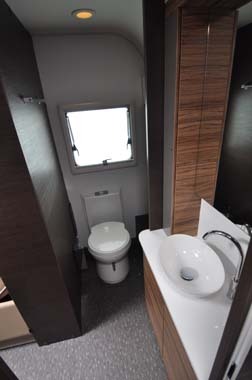 At night, it’s twin single beds (sister model Rio Grande has a double French bed), with adjustable backrest sections, while a full washroom across the back includes a step-in shower cubicle. There’s all kinds of upmarket specification throughout, like Alde’s heating and hot water system. With a hefty 1,800kg-plus starting weight, you’re looking at Range Rover territory for a suitable towcar. Or, maybe something like a Porsche Cayenne is more in keeping… Bear in mind, also, that maximum 8ft width here.Adria deserves applause, not just for its constant efforts to do some thing different, but also as arguably the only non-British caravan manufacturer that actually tailors its built to the UK. This flagship may not be to everyone’s taste – or indeed budget – but there’s a “halo effect” that filters down through the rest of its offerings. Style, panache, élan, je ne sais quoi… however you want to put it, this Adria has it in bucket loads. It’s certainly highly exclusive. And futuristic. And expensive. But, that’s not to say it’s not highly practical. It’s just a bit too avant-garde for our mainstream caravanning masses, surely? Plus: GRP-clad body with ten-year warranty, distinctive interior styling, sturdy all-round build with a good dose of individuality. AL-KO ATC anti snaking gives owners a sizeable insurance saving. There’s more information on the Adora range on the Adria Website and to find out more about our low-cost premiums visit the caravan insurance discounts page. 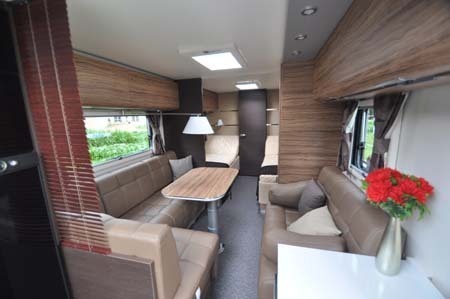 *Caravan insurance is based on 2014 Adria Astella Amazon Glam caravan retailing at £24,580 and including Astella Pack. Fitted with hitchlock, wheel clamp and AL-KO ATC anti-snaking device. Kept on drive at HX4 0BE. Caravanners over 30 years old, claim free for 3 years and a member of a caravanning club. £100 excess. 180 days European cover and up to £75 per day for up to 15 days emergency accommodation cover included. Legal expenses cover, extended European cover and other emergency accommodation expenses cover options are available at extra cost. Quote includes 10% online discount and 6% Insurance Premium Tax and is correct as of 11/March/2014. Managed to get a Bradcott air awning to fir the Adria, Bradcott modular air comes in porch, full awning & mid awning. I realise i am looking at an old thread, but i am after some advice. 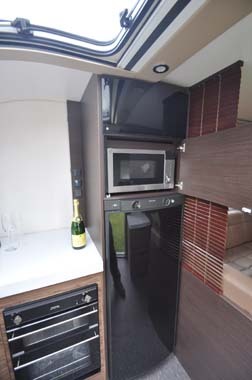 We have just purchased a 2106 Adria Astella Amazon, and are looking at air awnings. Because of the placement of the door,would a Kampa Air Pro 500 fit, if not what air awning would you reccomend. We have brought Adria estella rio grande glam edition.we went away for the first time and feel very disappoint. We are having problems with the heating – taking alone time to heat up on electric we have selected 3 kW even tried it on gas- the van is warm but there is no heat at the vents even when we turn it up to 30 degrees. We have had a looked at the Aldi insturtions but says nothing about how long it takes to warm up. We know that there is a booster on the shower and we have to wait 30 mins to make sure the water is hot enough but the hot water is not enough to take a shower ,is there a add on boiler that we can get do that we can use the shower ? Just picked ours up, love the caravan , shame it is full of niggly bits not quite the standard I thought Adria would send out. Overhead cupboards none of the catches line up, full of sawdust in the bottom storage areas, broken vent on the outside and most of the storage lockers catches or locks line up. Having said all the above I can fix these but at £25k why should I have too ? Sorry to hear you’re having some problems. Have you raised this with someone at Adria? That’s fantastic to hear! A glowing review of the Glam – Adria will be very happy. 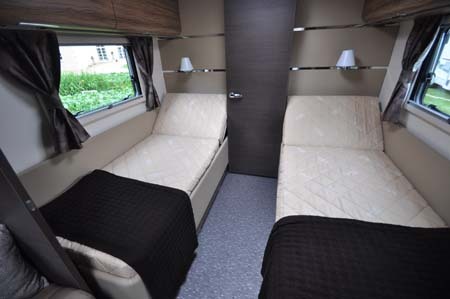 Adria’s build quality is simply stunning too – not just ‘Glam!’. 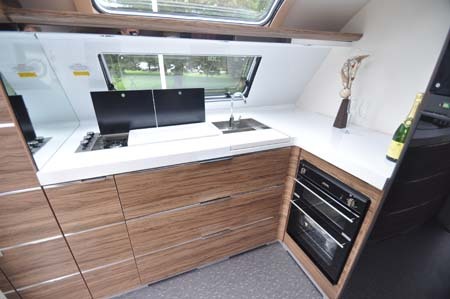 We bought a 2013 Adria Trent at the end of 2012 – never having considered an Adria before seeing it, and continue to be amazed at the high quality of the construction, fixtures and fittings. Pity the Caravan (members, remember!) Club seems to largely ignore the Adria caravan range, just whom are they protecting? Kind regards, John & Sheila. What a glowing review – great to hear that you’re happy with it John & Sheila! Hi Nigel is correct in saying it is the European model.. Would be interested if any one of your readers have got a astella glam I have one and think is great. 07971582145 if anyone would like to get in touch. O an caravan guard keep up the good work I like you reads. Thanks Mike, we’ll do our best! Like I said to Nigel, the model shown here is a prototype. It features elements of both the UK and European version. Just to let you know that the details you have on this page are incorrect, you are showing the European model, not the uk. I did call the office to notify your marketing dept and was expecting a call. We did get to the bottom of this after your initial conversation with a Contact Centre Adviser. Basically the model shown here (reviewed here in the UK) is a prototype. It has elements of both the UK and European version, the main differences being a separate oven and grill above fridge, no microwave and no blinds between the kitchen and lounge. We’ve confirmed this with Adria and are happy to leave the review as it is. Exceptional design and practicality, like all good ideas you look and think why did it take so long for someone to design it? The ultimate that could only be improved by adding a slide out to the living room and bedroom space thereby creating a walk around access from both sides double bed with access to the bathroom and of course a twin axle. Now I know what the future holds for caravan. Adria get a massive 95/100 from me and Attention, Interest, Desire and as soon as I can afford it Action to buy!